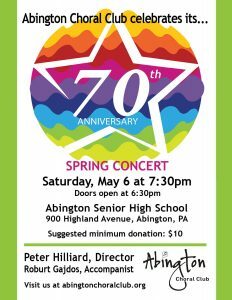 In celebration of Abington Choral Club’s 70th anniversary, our May 6th concert will feature musical selections from ACC’s first concert and from every ACC director’s tenure across seven decades, including choral classics and pieces written especially for the choir. In addition, the choir will premiere a new piece commissioned for the 70th Anniversary Concert by ACC Musical Director and award-winning composer Peter Hilliard. Guest alumni conductors Ed Conrad and Keith Beale will also participate in the program. Join us for this very special celebration!